Imigrant grindcore! That's never happened before! This band consisting of Nepalese immigrants who settled in the US because they and the members of their families were sentenced to death was formed in 2016. Some of their relatives are still in Nepal and are in danger of their lives. With their brutal grind destruction they indirectly want to attract attention to their fate and the fate of their families. We will definitely be given a quality harsh production and the band CHEPANG will be for sure given a warm welcome at the OEF 2018 in Trutnov!!! 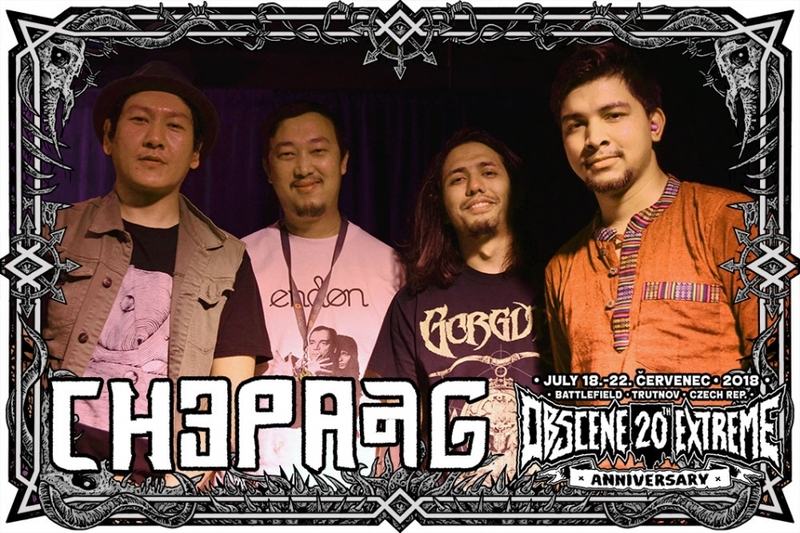 Chepang is a Nepali grindcore band from USA. We formed in 2016. We are originally from Nepal and have been residing in the states for the last decade. Coming from a war torn country , some of us have seek refuge in the states due to the imminent death threat to us and our family. Some of our family are still in Nepal trying to survive and sustain daily lives. Although the political situation is little more stable out there but there is still turmoil and inner political differences. This is still causing our country a great harm and feeding the people with pitiful lives. We are now ranked the 12th poorest country in the Nepal and also the poorest country in South East Asia. This frustration is what have bonded Chepang together. We all share the same emotion and feelings and the inner turmoil within us. In other hand people may listen to us and feel that we are just another grind core band with a socio political message but we are not that. We were in the middle of the civil war and directly in the front lines against it. This first hand experience to drive against the war is what makes us more unique. We strive to deliver our message with 500% more commitment . Not only this is what is driving our music but also the immigrant life that we are leading here in the states thats a mixed experience. In the positive side we do get to live a free life and basic needs are in plenty however there are moments where skin color drives the nature of a job or a conversation. Sometimes we feel like going back for good but then we remember that would mean risking our lives to be there and our family. However these negative thoughts and hate we try to steer away and create songs that speak about the struggles of a first generation immigrant. Thus we call our style of Grindcore “IMMIGRINDCORE”. Our first EP “ Lathi Charge” came out on Aug 1, 2016 via Nerve Altar (brooklyn, USA) and Holy goat records (Germany) and have received rave reviews and also got a spot to play at Maryland Death Fest 2017 in Baltimore, MD. However right after Lathi Charge came out, we started to think about our full length and where we can progress naturally and improve. Grindcore is such a niche genre that there are not a lot of things that can be done. Then we though to add an extra drummer to have 2 drums not only play live also record. 1 year later here we are a handful shows and tons of inspiration later we have our full length that’s coming out in Nov.3 .2017 through Nerve Altar and Holy Goat records again. It was Engineered and recorded by Kevin Bernsten at Developin Nations Baltimore, MD. Assistant Engineer Yave Rust and Mastered by Brad Boatright at Audiosiege .The blasts are stronger and filled with more flavor and love courtesy of the double drumming. We truly believe that this record will fill everyone with not only blasts but with heart full of love and message that we carry . The power to blast stronger for freedom has never felt so high and strong. 2018 Plans include a US tour with our fellow friends at Full of Hell , trip to Canada at Montreal Earslaughterfest 2018 and maybe an Asia tour as well.. Splits with our fellow grinders from Brazil Test and Organ Dealer from NJ. We hope to see everyone around the world and share them the power of Immigrindcore.